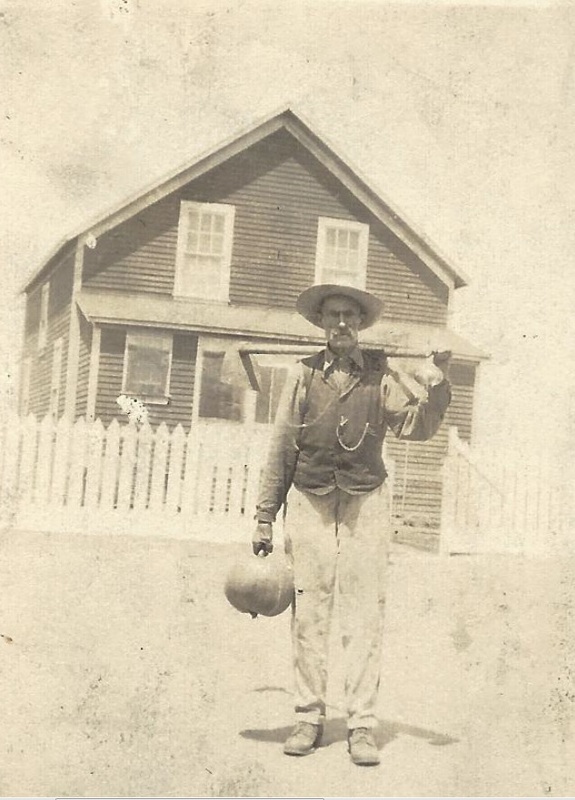 This week’s theme for 52 Ancestors is heirloom. One item I would really like to have is the bango tags of my great great grandparents is their bango. Do you know what a bango is? No, it is not a drug reference and I didn’t misspell a musical instrument. The word comes from the Japanese and means “ID Tag”. The tag represented the numerical system used to identify laborers in Hawaii during the sugar plantation era. The bango was designed for the convenience of the plantation, but it was also a symbol of the separation of the classes and races in Hawaii. Each laborer was assigned a bango tag with a unique number on it. I’ve seen photographs where immigrants fresh off the boat people already had their bango tags. They hadn’t even made it to the plantation, yet. Employees had to have their bango with them in order to get paid or for any monetary transaction between themselves and the plantation. The plantation management wasn’t interested in learning all the different ethnic names of their employees, some which were difficult to pronounce and to spell. Each employee was identified by his or her bango number. Wage, credit, loan, and other financial records were kept by this number, though I have seen some plantation payroll records by employee name. When pay day arrived, employees lined up to get their monthly pay. They had to have their bango tag with them if they wanted their money. No bango, no pay for the month. A lost bango meant lost wages. According to the Hawaii Labor History Glossary, the shape of the bango had meaning. Each ethnic group had its own shape. Each level of employment had its own bango shape. It was one of many racially demeaning practices employed by plantation owners. It sat along side the deliberate mispronunciation of names and ethnicities. Many don’t know that Portugee was a derogatory term used by overseers and lunas to make sure Portuguese laborers were kept in their place. Same goes for many other terms for other ethnic groups that I won’t repeat here. You all know what they are. My great great grandparents, Jozimas and Maria (de Mello) de Braga, left their village of Maia in 1882 with sugar plantation contracts in hand. 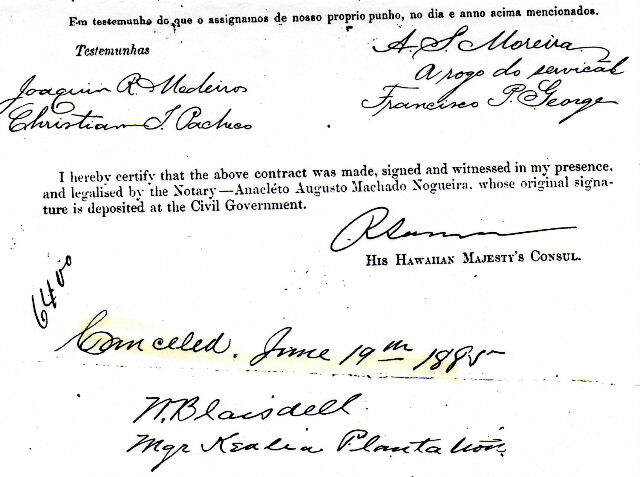 They were assigned to the Kealia Sugar Plantation for the duration of their contract. Once completed, they moved to Kilauea and worked on the Kilauea Sugar Plantation. I would love to own this little bit of their history. It would be a symbol of the menial labor they toiled through but also the better life they were creating for their children and grandchildren. While the 10 hour a day, 6 day a week field labor was harsh, it was the path they created for the next generation who would get an education and move up the ladder. Unfortunately, very few bango tags exist today. I’ve only met one person who has their ancestor’s bango in the 25+ years I’ve been researching. The article “Plantation Workers Lost Their Names to Numbers” (in PDF format) has some wonderful examples of bango tags if you would like to see them. Ronald Takaki has written a wonderful book about the sugar plantation era in Hawaii. He covers the different migrations, ethnic groups, and the cultural differences on the plantations. If you are interested in what life was like for laborers and the difficulties that came about bringing so many ethnic groups together, you should read his book. I had not heard of bango tags before reading this and found it quite interesting. Although the thought is bittersweet, I’ve much respect for past generations who lived through their enslaved lives for the sake of the next generation. What some parents will do for their children is wondrously amazing. Maybe we should all have a symbol of that character to hold on to. Beautifully said, Ruth! It is easy to dismiss our ancestors, but it must have taken so much courage to leave everything they knew to places they had never really heard of. Then, the work they did was menial and backbreaking, but they did it so their children would have a better future. It is admirable. Jo, thank you so much for sharing my story! It is an interesting part of Hawaiian history that not many know about. I DID NOT KNOW ABOUT BANGOS UNTIL I MOVED TO THE BIG ISLAND.MY GRAND PARENTS AND UNCLES WORKED IN THE PALANTATION.I HAVE THE PAPER WORK WITH THEIR NAMES ,PHOTOS AND BANGO NUMBERS.I ALSO HAVE THEIR BANGO TAGS. Joji, You are very lucky to have the bango tags as well as the paper work. Many people have no record of their ancestor’s time working for sugar plantations outside of the census.